I designed this bedroom for my eight-year-old girl Bela. We both got really trired of her pink walls and thought it was time to freshen up a bit. I wanted to create a timeless space for her. So I opted for neutral color walls, lots of geometric patterns, streamline furniture pieces, and colorful accents. The space feels so airy and yet very cozy. 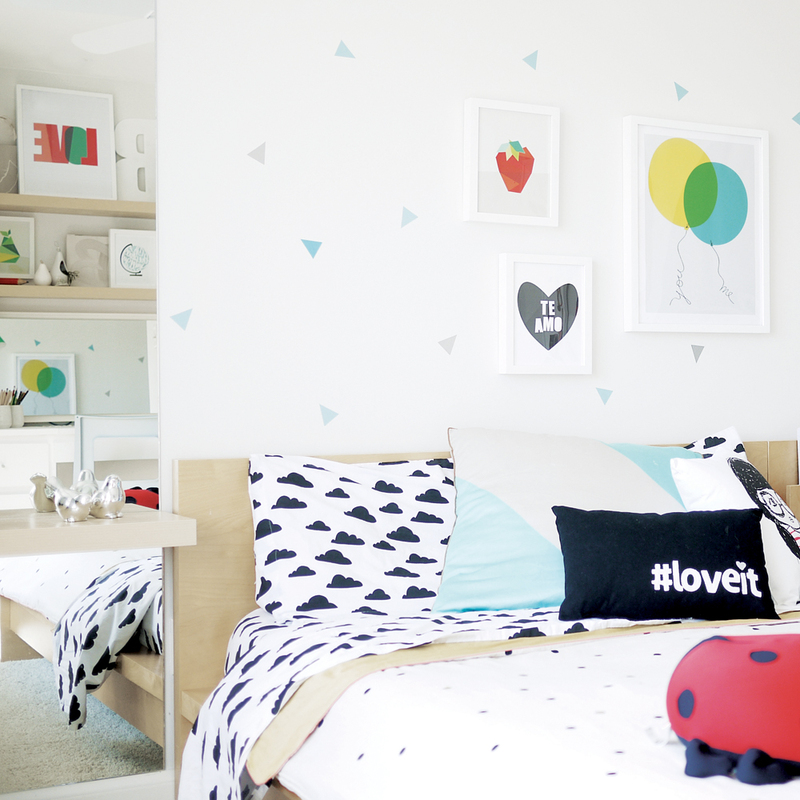 The main inspiration for this room was the mini triangles wall decal. Once I decided to use them in creating a focal wall, I started to look for other geometric pieces for the room. The bedding was a great find. I think it works well with the color of the furniture and it is not too busy that it takes away from the focal wall. I like spaces that are surrounded by great lightning, lots of white, streamline furniture pieces and colorful or rustic accent pieces. For this project I used a lot of my own pieces. It makes the project even more special to me when I can actually design a custom art print or custom wall decal for it. Here are some of the sources for the room. The desk lamp and wall decals are my favorite pieces in this room. They always stand out to me no matter where I look. where is the TE AMO art from? It is from Trendy Peas.